So, the moving plans have been delayed a little bit, it seems, since well... we're not there yet and it's passed the 17th. :-P We got a call from the British Consulate a few days ago saying that they got our visa requests, but they just needed me to fill out one more online form before they could process our papers and mail our visas and passports back to us this week. Naturally, one of the questions the online form asked was, “What is your passport number, issue date and expiry date?” and I didn't have that information on hand, seeing as how we had already mailed our passports to them to begin with (let this be a lesson to always make copies of any important documents you own, just in case...). So Tim and I had to drop any plans we had for Friday to drive nearly two hours into Vancouver, to wait in a huge line at the passport office, (it always amazes me how full that place is) so that I could get my passport number from one of the officers. Thankfully, it didn't take as long as I thought it would. We drove back home, filled out the form and sent it, and they should be processing it on Monday, and hopefully we'll be getting the papers in the mail before this week is up, as we need to be out of this apartment by next Sunday, because our landlord already has a couple ready to move in on the 1st of October. Also, to make things just a bit more complicated, Tim finally got approved for his Landed Immigrant Status! This is actually a very good thing, except for the inconvenience of the timing, since we now need to send Tim's passport to the Canadian Consulate as well, so that they can issue him his Green Card. So once we get our passports back from the British Consulate... we then have to get the passports to Buffalo, before the 12th of October. Of course now the question is how to do this in the most efficient way possible, and so far we have two options. The first is that as soon as we get our passports back, we pack our few pieces of luggage up into Tim's truck and take a three-day road trip to Buffalo. We estimate that driving will be cheaper than two one-way flight tickets there, and the landed immigrant visa will be quicker to process if we can get Tim's passport to them in person. The other bonuses are that since we will be so close to Toronto, I can visit my mom and hopefully some of my friends as well, and Tim can also visit his dogs in Michigan and leave his truck at his friend's place. The second option is to mail Tim's passport to Buffalo, and stick around for a few more weeks as Battlestar Galactica may have some more work for Tim to do in the next little while, and turning down extra money is not exactly in our best interest at this point in time. Of course that also means that we could be waiting around for an undetermined amount of time before we'll be able to get to England, because if we send it my mail, it could take anywhere from 15 days to a month for them to process the stuff and get it back to us. I am personally hoping for the road trip option, since it would get us out of here much more quickly. The only way we'll stay in BC any longer is if Battlestar actually calls us within this next week and gives us work to do... but they're not exactly too reliable so we could be waiting around for nothing (they called us about two weeks ago saying they had work for us then, and so far we've not heard a peep back from them). So yeah. That's the situation. iron_raptor and pat_the_fox, if you're reading this, I may be needing a place to crash on Sunday, if not for a few days until Tim and I have confirmed some solid plans for getting out of here. I will cook for you both. ;) I'll give you guys a call soon this week. In the meantime, the rest of this week will be spent brushing up on some 3D and Fusion training, collecting texture references and practicing painting a few sample texture maps from scratch, putting the last few of our belongings into storage, (this house is so empty, it's kind of depressing...) and then cleaning up the house so that it is all tidy for the new arrivals. On a couple of separate notes, last night Tim and I watched “What The Bleep!? Down The Rabbit Hole” again, with a neighbor friend of ours. Tim thought that it would be a good, inspiring thing for her to watch, since she's been dealing with a lot of challenges in her life lately and needed a bit of a pick-me-up. It's sad to see such nice, creative people in such a depressive, blocked state... she does such wonderful work with plants and pottery, but is still not feeling very fulfilled in her life's achievements. So she was very impressed with the movie last night, and it gave her a lot to think about, which seems to be a very common reaction from other friends of ours who've seen the movie as well. She said that she'd like to try and get it herself some time, and watch it over again, and take down some notes. I tell you, it was very good to watch that again last night, as I personally have been needing to see that again, since I've spent the last 7 months trying to recover from a blocked state myself. 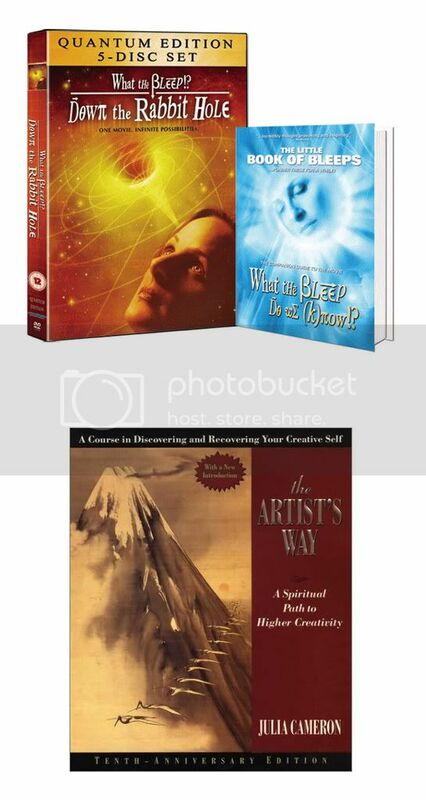 A bit of advice to anyone out there who is feeling a similar loss or absence of meaning in their life, if you want to make some very significant positive changes to yourself, this movie, along with the book by Julia Cameron, “The Artists Way” will totally shock you (in a good way) and give you a lot to think about. It is honestly the best kind of eye-opening experience you can give yourself. And lastly, just a bit of advertising for an awesome Amish leather craftsperson - just wanted to spread the word. I got some dog collars made from BFLF Collectibles, after I got ripped off from some other e-bay Amish leather seller (live and learn). The original seller had some really nice designs, and I was determined to find another place that could replicate the designs I wanted, and so was pointed to BFLF from someone else who was also ripped off from the first seller. Well, they reproduced the original designs flawlessly, and sell really good quality leather stuff for insanely cheap prices!! 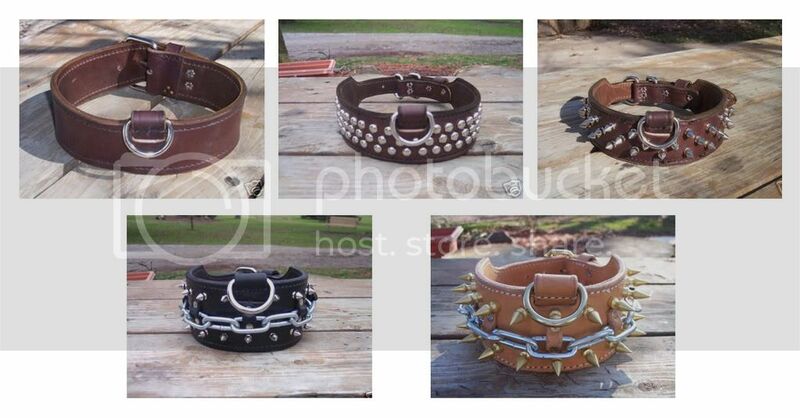 I'm talking anywhere from $12 to $40 for double layered, handmade collars (around $12 for just plain brown leather, $16 for the rounded studs or half-inch spikes... and $35 - $40 for the heavy duty 3” wide collars with the one-inch spikes and chains). So, if anyone else is into the more heavy-duty buff looking collar designs, feel free to contact Linda Flenner at BFLF6732 @ aol.com She'll take just about any design, custom-made to order, is very pleasant to deal with and ships the products fairly quickly. I'm hoping you get the first option in your travel plans. I hate the idea of mailing something so important and then just *waiting. * That has ended up badly for me too many times. If you end up mailing the passport and waiting, I wish you the best of luck! Ooo.... that upper middle collar is NICE. Like the one Taff' has now, but with the ring in the middle and tapered ends. Cool. You've already seen it?? Well darn, there goes my surprise. :-P I believe that "Down The Rabbit Hole" is actually the second one... the Quantum Edition is an extended version of the theatrical release "What The Bleep Do We Know?" and has a shitload of extra interviews that weren't released in the first movie. No worries, just give a call when you can. If you call me make sure it is after six. If you call Rap I think you can peg him at any time.